Salina de la Renta is not one to be trifled with. As MLW’s empresaria of Promociones Dorado, de la Renta leads a squad that includes former MLW World Champion Low Ki, “The Sicario” Ricky Martinez, legendary luchador LA Park and his son, Hijo de LA Park. She can be seen week in and week out on MLW Fusion ensuring that her and her stable are atop MLW and the wrestling world by any means necessary. The person behind the character, while much nicer, also has a very similar drive to succeed in the wrestling world. A drive that started in what many die-hard wrestling fans would consider the unlikeliest of places. De la Renta actually began her career in the ring before a serious knee injury relegated her to the sidelines. Rather than whine and cry about her luck – or, worse yet, quit – de la Renta had impressed someone that would open her door to national television. 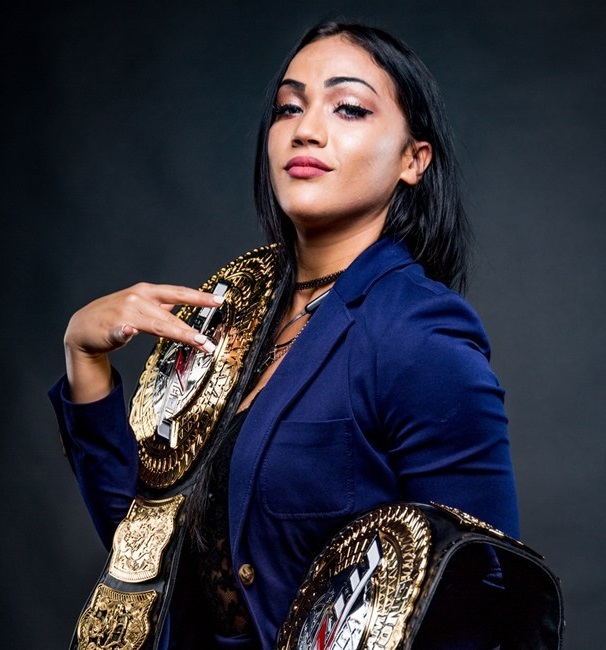 MLW Executive Vice President of Wrestling Operations MSL, who had seen de la Renta wrestle and train in Florida, offered her a spot in the newly recreated MLW. Initially a backstage interviewer role, de la Renta quickly transcended that role as her knowledge and experience in television and acting led to her becoming the notorious impresaria for MLW. That determination and lifelong drive has led de la Renta and Promociones Dorado on MLW Fusion. According to de la Renta, there’s more to come. ← ESPN: Why are so many wrestlers ‘Best Friends’?